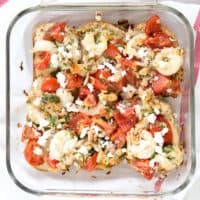 Shrimp, Tomato, and Feta Bruschetta | Good. Food. Stories. Think of how many pots, pans, and dishes are in your kitchen right now, taking up the bulk of your cupboard space. Now mentally remove the Bundt pans, food mills, and other specialty items from your stash. Pare it down to the workhorses of the group—the pans that get pulled from the shelves nearly every day, loaded in and out of the dishwasher, and heaped with love and abuse. Chances are your mental image includes a simple square baking pan or ceramic casserole dish. 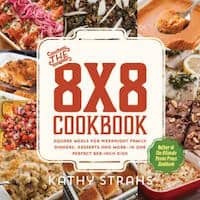 The 8×8 Cookbook: Square Meals for Weeknight Family Dinners, Desserts and More—In One Perfect 8×8-Inch Dish by Kathy Strahs makes the most of that versatile pan, using it as a vehicle to cook family meals for every hour of the day. It’s a brilliant conceit—as Kathy notes in the book’s introduction, the 9×13-inch dish (AKA the “lasagna pan”) sees a lot of love when seeking recipes for potlucks and family dinners. but beyond baking, the smaller square pan gets short shrift. As a professional recipe developer, it was easy for Kathy to adapt recipes intended for 9×13 dishes, but why make everyday cooks go through that trouble time and time again? “Wouldn’t it be nice,” she writes, “to have a collection of dishes that were created with the needs of the 8×8 size in mind?” The 8×8 Cookbook neatly fills that niche with more than 60 recipes to take you from breakfast to dessert. Ever made pancakes in an 8×8 pan? You can do that here, with a clever repurposing of the batter into an upside-down cake that, when flipped, boasts a layer of caramelized bananas. 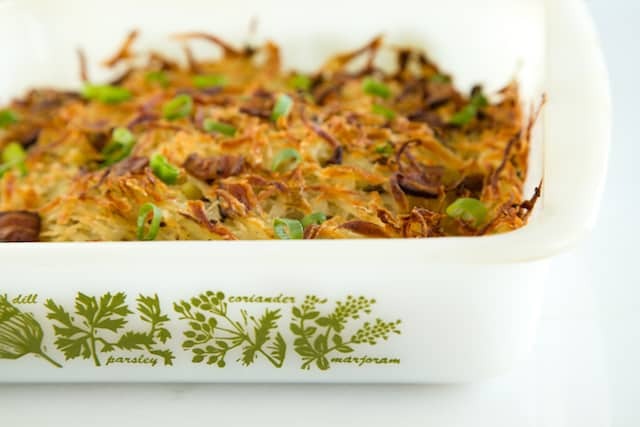 Those of us who lean towards the savory side of the breakfast-brunch spectrum might end up eating the entire pan’s worth of roasted hash browns with bacon and scallions—which also makes a most excellent dinner side dish. Along with classic casseroles and sides like sausage and spinach stuffed shells and maple-bacon baked beans, it’s refreshing to see how truly multi-purpose and versatile the 8×8 dish can be for lunches and dinners. A huge chapter of easy weeknight meals runs the gamut from pan-roasted pork chops with apples and couscous to surprisingly fancy and filling—but definitely not difficult—shrimp, tomato, and feta bruschetta (recipe follows at the bottom of the post). 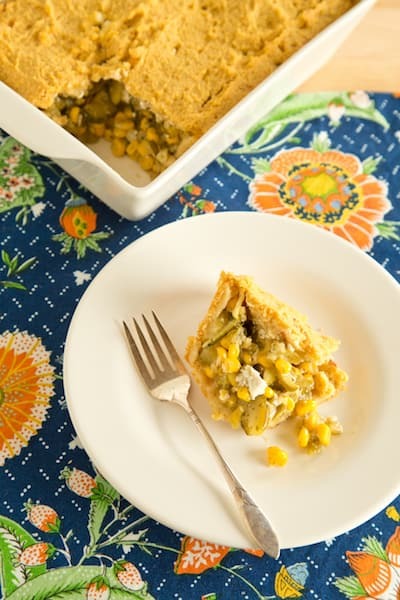 Any of these dishes would be company-worthy in my book, but The 8×8 Cookbook also offers up a few special Sunday dinner options that are a bit more time-intensive, like our new family favorite, a hearty vegetarian zucchini, corn, and green chile-filled tamale pie. As for dessert, the meal where 8×8 baking dishes tend to get the most action, there’s no shortage of tempting ways to fill the pan. 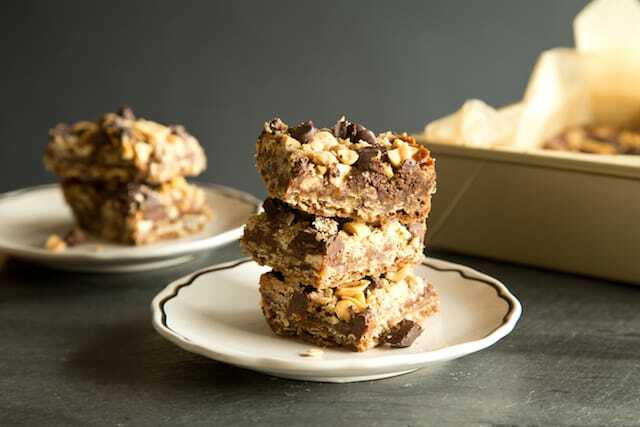 Dreamy caramel bars topped with chocolate and nuts? Croissant bread pudding with espresso butterscotch sauce? Balsamic cherries with graham cracker crumble? Coconut rice pudding? Yes to all of these and more. Because most of us have a stack of different 8×8 pans in the cupboard, Kathy helpfully explains which kind of pan—glass, metal, or ceramic—works best for certain applications at the outset of the book. Glass won’t brown the bottom of your food as effectively as metal will, for example, but it will retain heat longer, so it’s better for baking pastas than cakes. Each recipe includes a cute graphic noting which type of pan she recommends for the food to follow. Kathy also knows that these are the kinds of dishes that you’ll want to share with others, so she offers a few quick-reference lists of her recommendations for the best freeze-ahead dishes, make-and take dishes, and bake sale snacks from the book. Smart thinking! With a book like The 8×8 Cookbook at my disposal, it might be time to add a few more vintage Pyrex dishes to my collection. I might need them for all the 8×8 baking I envision in my future. 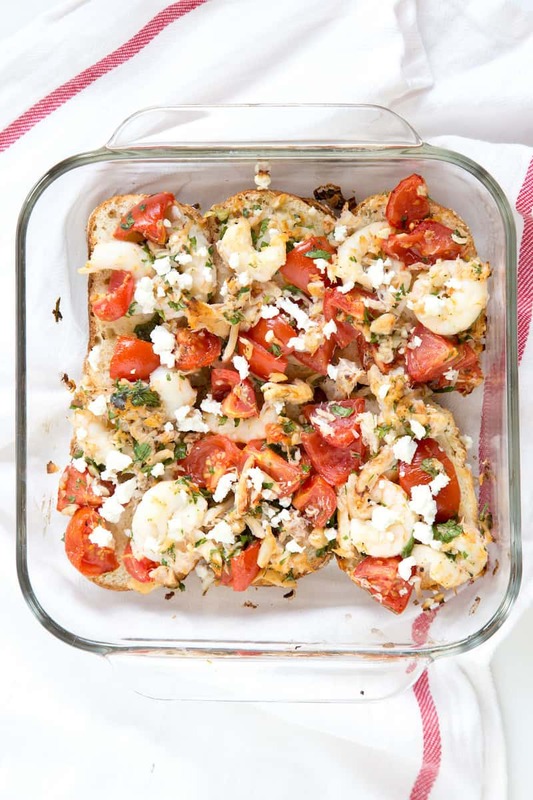 Roasted shrimp, tomato, and feta bruschetta from The 8x8 Cookbook turn a handheld appetizer into a hearty weeknight family meal. Swirl 1 tablespoon of the olive oil in a 8x8-inch glass or ceramic baking dish to coat the bottom of the dish. Arrange the bread slices inside the dish—the exact number of slices will vary according to the size and shape of your bread, but you want to try and cover most of the bottom. Toss the remaining 2 tablespoons olive oil with the shrimp, crab, tomatoes, parsley, garlic, lemon juice, salt, and pepper in a large bowl. Pour the shrimp and crab mixture over the bread in the dish. 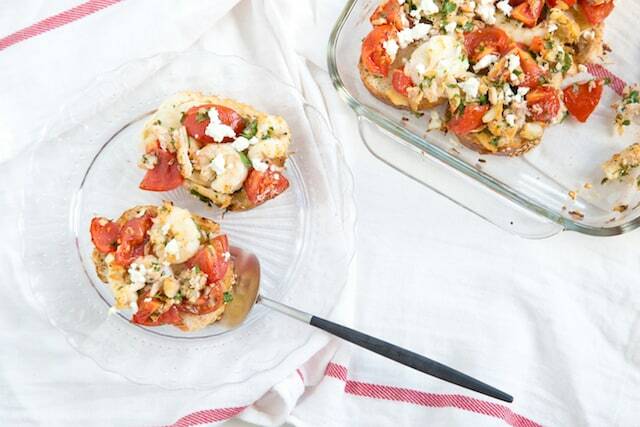 Sprinkle the feta cheese evenly across the bruschetta. Cook until the shrimp is pink and cooked through, about 20 minutes. Serve with knives and forks—unlike traditional bruschetta, this is a juicy, tasty mess! The original recipe calls for 1 pound shrimp, but I've adapted it slightly to include crab, my favorite crustacean. Feel free to substitute or add scallops if desired—like many of the recipes in the book, it's very versatile!